Early explorers and pioneers referred to their settlement as “North Falls” until it was designated as a post office called Bracebridge in 1864. In response to a request from the settlers, Bylaw #162 was passed by the County of Victoria in 1874 and the Village of Bracebridge was born. 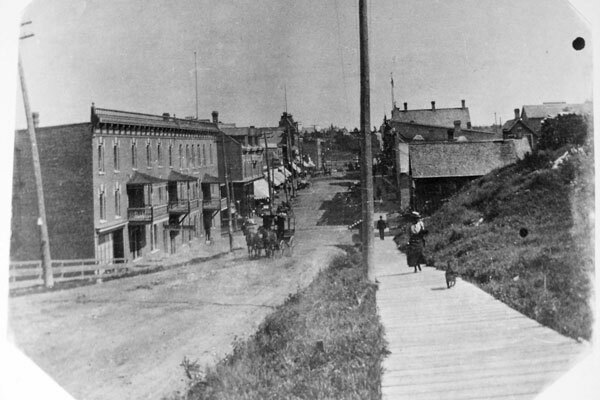 Bracebridge quickly became the focus area for development in those early days because of the extremely important availability of the hydraulic power provided by numerous water falls. The area was also attractive because of the superb access to the great lakes of Muskoka provided by the Muskoka River. It was in 1859 that the first settler, John Beal, came to Bracebridge and built his rudimentary log shanty on the east side of what we know now as Manitoba St., just north of Ann St. Why he chose that site is unknown because he must have endured climbing several steep ravines to get there. He was followed shortly by David Leith and James Cooper, who had been contracted to build the colonization route called Muskoka Road, northerly to the settlement of North Falls. It wasn’t long before things started happening. The Alexander Bailey sawmill, grist mill, Victoria Hotel, Harvie Line of Royal Mail Stages, The District Exchange Store of John Teviotdale, Hiram James McDonald’s store and Royal Hotel, James Cooper’s Hotel and Thomas McMurray’s newspaper The Northern Advocate were among the first business ventures; all supporting a growing number of manufacturing enterprises and a thriving lumbering industry attracted by the huge pine, hemlock and hardwoods dominating the landscape and which were in such demand by shipbuilders, especially in Britain. The Bird Woollen Mill, Beardmore Tannery, Huntsville & Bracebridge Tanning Co., Muskoka Linen Mill, J.D. Shier Sawmill, Singleton Brown Shingle Mill, Marble Works, and many others all settled in Bracebridge within a short period of time and steered the community into the leadership of Muskoka commerce that it still enjoys to this day. There have been many celebrations in Bracebridge since those early days, the earliest being the celebration of the Confederation of Canada on July 1st, 1867 and the most recent being the 125th anniversary of the creation of the Bracebridge municipality.